Today at 4pm the AA will be filled with the sound of dribbling basketballs as the Wyoming Cowboys have their first practice of the 2013-2014 season. Coming off a 20-14 season the Pokes have some questions to answer with the graduation of Leonard Washington, Darrius Gilmore and Luke Martinez. The Cowboys look to have some able replacements who should hit the ground running to fill the void in transfers Charles Hankerson (Alabama) and Jerron Granberry (North Florida). Wyoming’s leading returning performer is the talented Larry Nance Jr. who will be looking to improve on his stats line of 10.7 points and 6.9 rebounds per game. 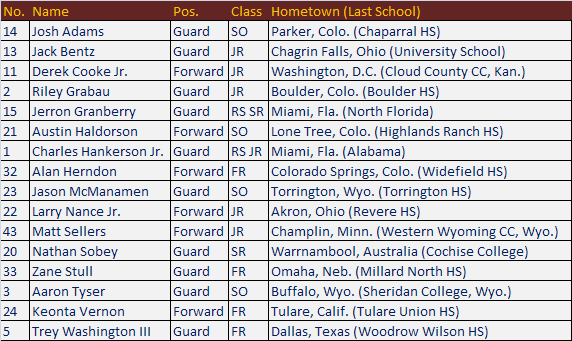 Other returnees who could see prominent roles include Riley Grabau who could be Wyoming’s point guard and forward Derek Cooke Jr. who improved with playing time last season. As you can see in the roster below, there are quite a few new faces on the squad this year. The Pokes have one of the best coaches in the country when it comes to team building in Larry Shyatt who will get the incoming players to buy into his defense oriented team first philosophy. It will be interesting to see which freshman can crack the rotation come conference time. Leading candidates to do that would have to be point guard Trey Washington and forward Keonta Vernon. October 31st is the first game this season when the Cowboys will host CU-Colorado Springs in an exhibition.